The design of the milking bail, its pipework and the pit is an important factor in keeping cows and people safe and can ensure good cow flow into the dairy. Decreased animal health costs - good platform and pipework design will lower the incidence of cow injuries. Increased worker safety and comfort - include ergonomics in the design to increase worker comfort and decrease injuries. Bails and pipework which are designed correctly will position cows in a way that decreases the danger to milkers. Improved cow flow - well designed bails and pipework will maximise the cow flow through the dairy and simplify handling. Cow spacing on a herringbone platform. 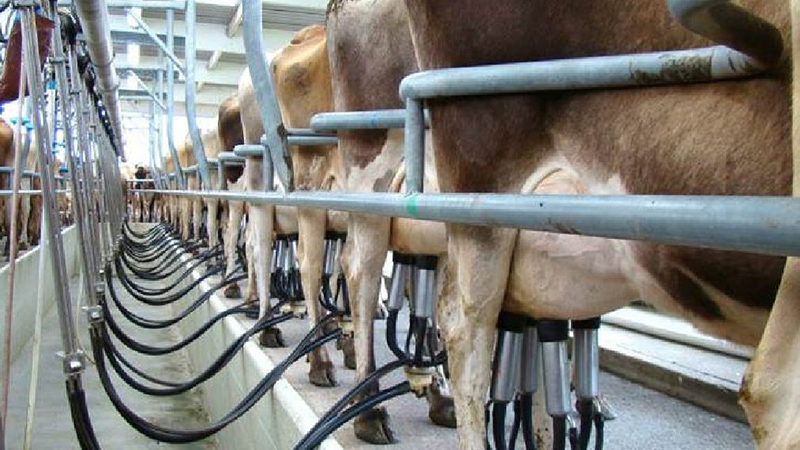 The angle that cows stand on the milking platform at determines how much width each milking position requires. For optimum cow flow, position cows at an angle of roughly 45-55 degrees. Wide cluster spacing is better for cow flow - at least 700mm. Breast rail height 760mm for Friesian, 700mm for Jerseys. Breast rail is too high, disrupting cow flow and preventing cows from rowing up properly. 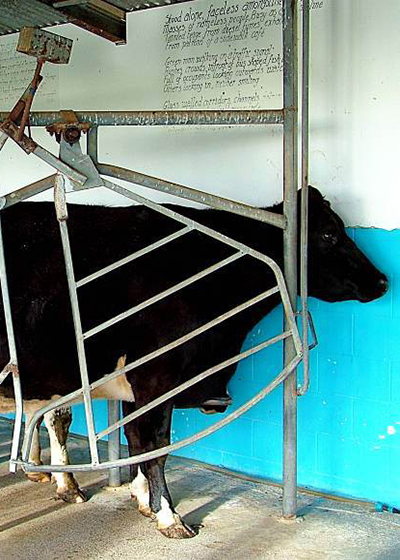 A zig-zag rump rail will help cow alignment. Make sure it is in line with the edge of the pit. Zig-zag rump rails are a recommended alternative to straight rails and are designed to control the cow’s position and alignment with the cluster. The aim is to produce a faster, more even milking, and better cow flow - as the cows know when they are in the right position. The zig-zag rump rails help by stopping cows getting too close to the pit edge and stepping back into space, which can be a frightening experience for them. The rail should be 800-950 mm high. Lower zig-zags may catch on cows’ legs when entering the platform and dig into their udders when they stand in the milking position. The milk line should have the same centres as the zig-zag rail. If the centres are 760mm or less, allow 360-400mm width across the rump. 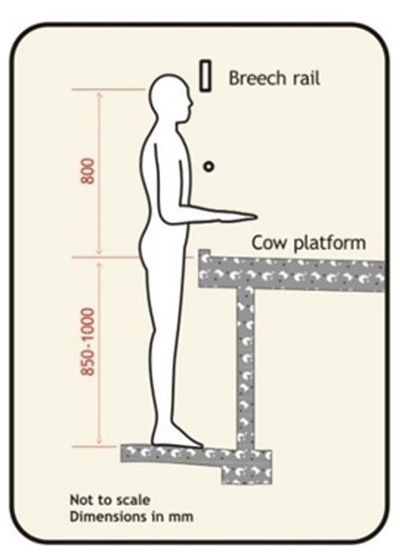 The breast rail needs to allow enough movement to accommodate cows when they are heavily in calf as with a zig-zag rail, they cannot adjust their space by sliding along the rump rail. The zig-zag should be in line with the edge of the pit, otherwise milkers may have to reach under the kick rail to apply cups. Height of top of rump rail 900mm high, kick rail 200mm below. 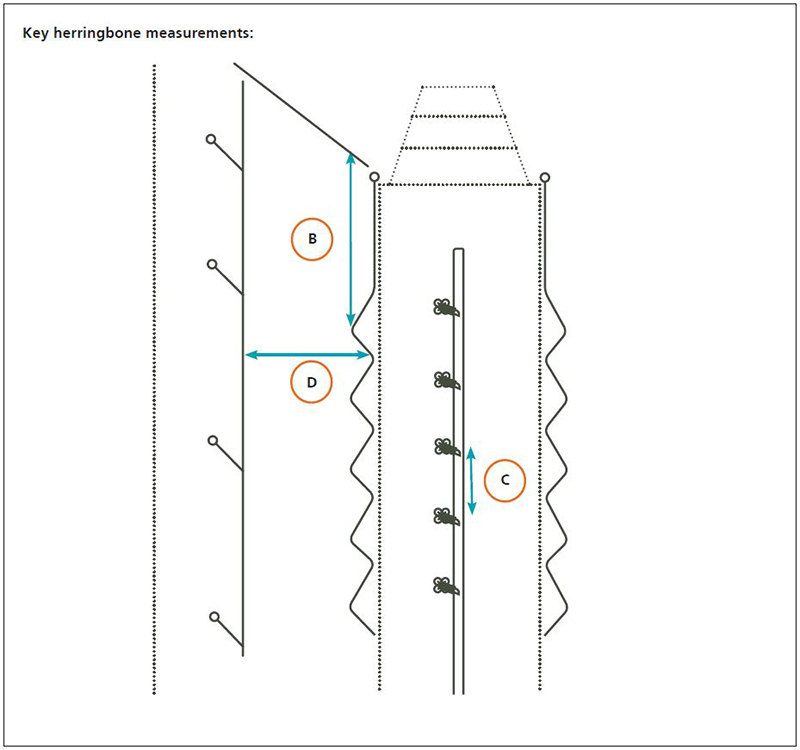 Key herringbone measurements. B=cluster spacing + 200mm, C=700mm or more better for cow flow, D=depends on cluster spacing, between 1100 and 1450mm. The design of the first bail in herringbone dairies has an important effect on cow flow. If it is uncomfortable then cows will not want to be the first to enter the dairy. The first bail space should be up to 200mm larger than the other bails. 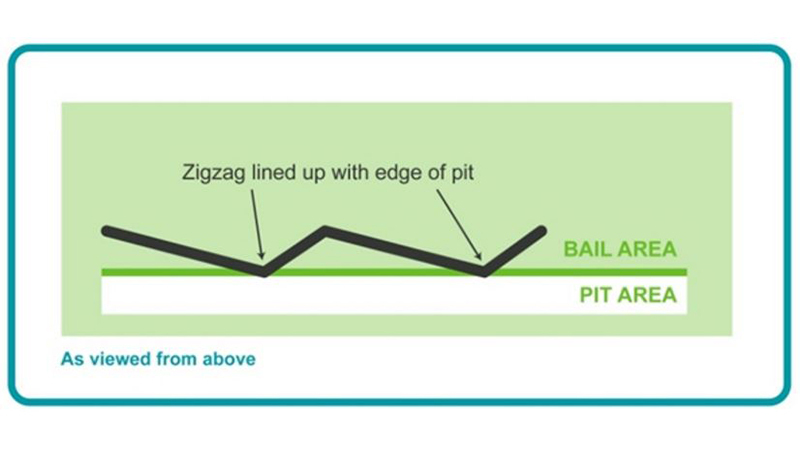 If the first bail is too tight, and the dairy has zigzag rails, replace the first two zig-zags with a section of straight rail. The position of the hinge post for the front gate can restrict the size of the first bail. The hinge post should be located in line with the edge of the pit, and zig-zag rails should not angle back to the hinge post. Uncomfortable first bail, also obstructs exiting. Make sure that the first bail allows the cow to stand comfortably without any pipework in her face, and without the possibility of getting her head caught between any rails. Make sure the uprights around the first bail don’t obstruct the exit from the dairy as this will cause cows to back up to negotiate a way around them, hindering cow flow. If a nib is too high it can interfere with cluster placement. Use a 20mm steel pipe with a 20-30mm gap between the pipe and the concrete. Support the pipe every 800mm. High concrete nibs are not recommended as they interfere with cluster placement, and cows tend to stand on them. Cows walking off-centre because no nib installed. The pit is the area of the dairy where milkers spend most of their time. A poorly designed pit can reduce milking efficiency and lead to injury. 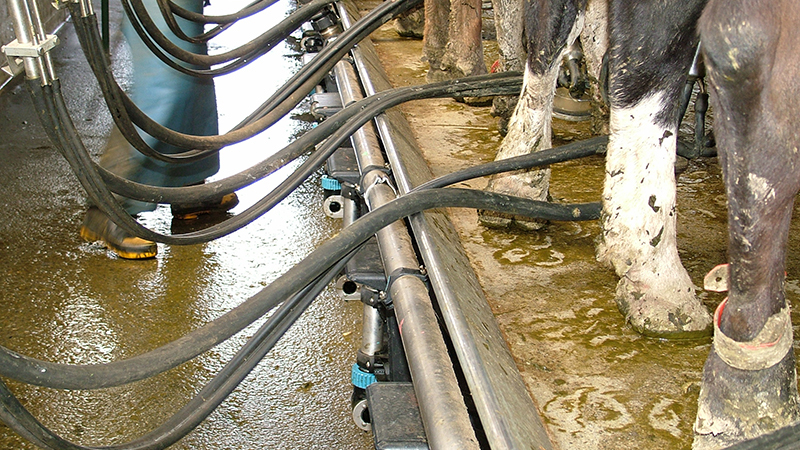 Pits should be designed for milker comfort, safety and ease of movement. Increased worker safety and comfort - including ergonomics in the pit design will decrease injuries. Increased work efficiency - correctly designed pits will allow milkers to work more efficiently, saving time when milking. Dairies with pits that are too shallow can lead to considerable problems for milkers over a period of time. The most ergonomic height to work at is between hip and shoulder. 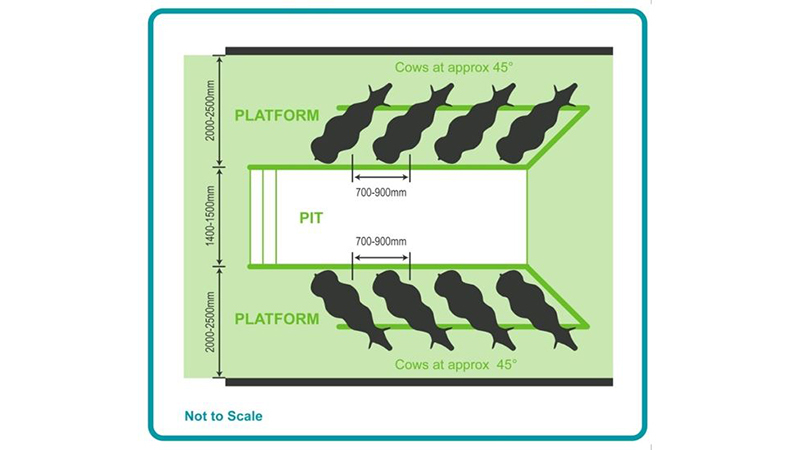 In general, pits are from 850 to 1000 mm deep, just below waist height for most milkers. It is better to build a pit too deep rather than too shallow. Deeper pits can be adjusted for shorter milkers by using matting or some form of adjustable or automatic platform. Deeper pits allow better visibility of teats and udders and are generally better from an OSH perspective as less bending is involved. Pit walls should be angled, with pit narrower at top than bottom so feet can be under the bail and the milker can comfortably get close to the cow. 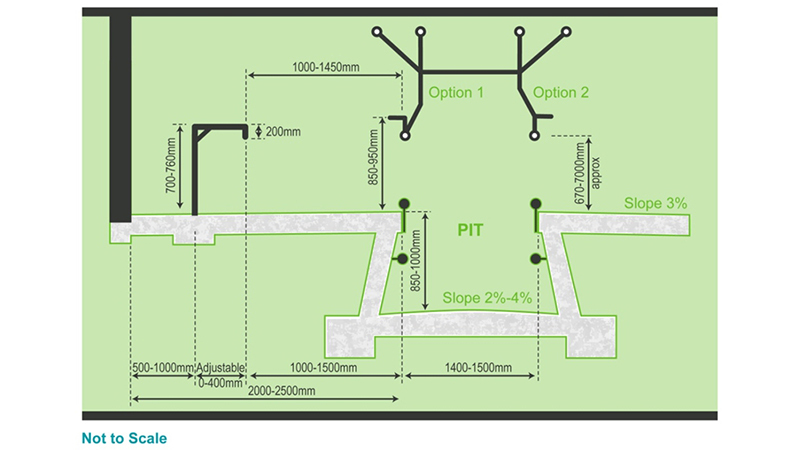 The platform should slope away from the pit by 2-3%. This ensures water and effluent flow away from the pit. The surface and slope of the pit floor has a big influence on how tired those working in the dairy will feel at the end of milking. The pit floor drainage can be an OSH issue. The pit floor should be raised 45 mm in the centre, falling to the pit walls. This raises the heels and eases the strain on the milkers’ calf muscles. Soft flooring e.g. 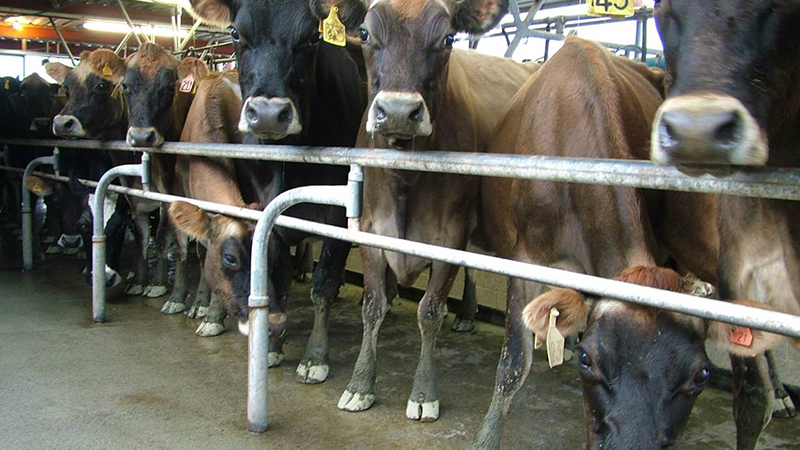 rubber matting (or soft footwear) can greatly improve milker comfort, reduce fatigue and the strain on joints from standing on concrete for long periods. Keeping non-slip flooring and steps clean prevents injuries. Pits are generally 1400–1800 mm wide. The use of swing arms to improve cluster alignment helps make wider pits possible but they are still slower to operate than narrow pits. 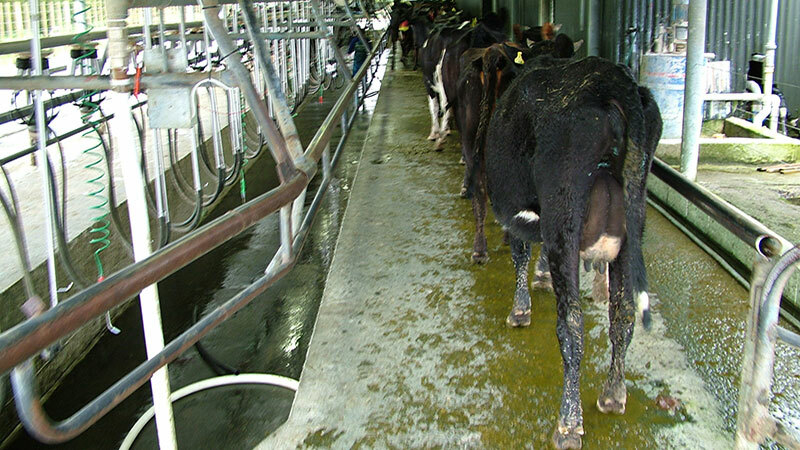 Greater width means more walking is required, but the milking area is less cluttered. 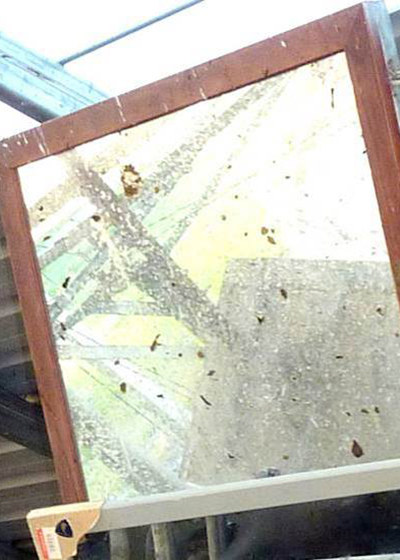 Consider a mirror for checking yard situation and backing gate placement. Consider a mirror for checking yard situation and backing gate placement, rather than looking into or entering the yard (disrupting cows). Exit and backing gate control access in multiple places in the pit. Any meal feeders divided into two sections so you can be feed half a row at a time. Keep pit floors clear of hoses and other items by providing convenient, safe storage space in the pit. A storage cabinet in the pit area means that the milker does not have to leave the pit to retrieve utensils such as scissors, RMT kits and spray paint etc.